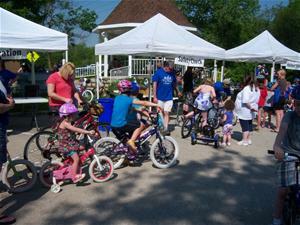 Children wait for a bike safety check at the Bike Rodeo. Wear a helmet - For kids and adults alike, wearing a bicycle helmet is the most effective way to prevent a life-threatening head injury. For more safety tips, join the Commission at their annual Bike Rodeo in May. The Rodeo is held outside City Hall at 28W701 Stafford Place.